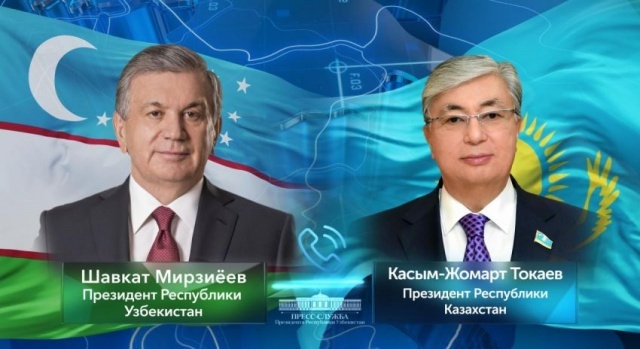 Today, President of the Republic of Uzbekistan Shavkat Mirziyoyev held a telephone conversation with President of the Republic of Kazakhstan Kassym-Jomart Tokayev. The Head of the state expressed sincere congratulations to Kassym-Jomart Tokayev on the latter’s assuming the office of the President of the Republic of Kazakhstan, and wished him every success at the high state post. This constitutes once again a clear indication of the tremendous confidence in the new President of the country from the eminent son of Kazakhstan, the First President Nursultan Abishevich Nazarbayev and the entire people of Kazakhstan. The progressive consolidation of the centuries-old bonds of friendship and good neighborliness between the two fraternal countries and peoples, the enhancement of the strategic partnership at a new stage, as well as the expansion of the multi-dimensional practical cooperation between Uzbekistan and Kazakhstan were noted with deep appreciation. Last year, in the Year of Uzbekistan in Kazakhstan, the two nations achieved record turnover indicators, they spearheaded new cooperation projects in diverse sectors of the economy, intensified contacts at the level of business and regions of the two countries, including cultural and humanitarian exchanges. A joint action plan was devised that contains a rich program of activities within the framework of the Year of Kazakhstan in Uzbekistan projected for this year. During the conversation over the phone, the heads of the states stressed the importance of full realization of the agreements at the highest level. As reported by the Press Service of the President of the Republic of Uzbekistan, the two sides also exchanged views on pressing issues in the regional and international agenda. President Kassym-Jomart Tokayev expressed deep gratitude to President Shavkat Mirziyoyev for earnest wishes and willingness to continue the active dialogue at the highest level. The heads of states exchanged heartfelt greetings on the occasion of the upcoming spring holiday Navruz and reaffirmed their shared determination to bolster the relations of friendship, good-neighborliness and trust, as well as to enhance extensive cooperation for the good of the two fraternal nations in the interests of peace and prosperity of the entire region.